Body Conditioner from Green Mountain Nutritional Services, Inc. is an equine fat supplement is composed of flaxmeal, extruded soybeans and coconut oil. Fat delivers a higher digestible energy source without the complications of carbohydrates, and has twice the energy of cereal grains. 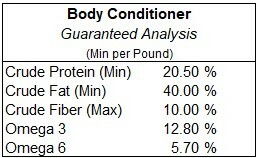 Body Conditioner will not create uncontrolled energy like feeding extra grain. Body Conditioner delivers slow burning calories in the form of highly digestible fats, to significantly increase energy intake without making the horse hot or unthrifty. Body Conditioner can be used to maintain weight on hard keeping horses, help colts achieve optimum growth, help lactating mares produce more milk and improve endurance. Feed 2 ounces daily to enhance skin and coat or 4 ounces daily to gain weight, improve body condition, and strengthen stamina. A 2 ounce scoop is provided. Available sizes for this product are 10 and 25 pounds.